The Gentleman's Stable Directory or Modern System of Farriery. Comprehending All the most valuable Prescriptions and approved Remedies. interspersed with Occasional References to the dangerous and almost obsolete practice of Gibson, Bracken, Bartlet, Osmer, and others; also particular Directions for Buying, Selling, Feeding, Bleeding, Purging, and getting into Condition for the Chase; with experimental Remarks upon the Managment of Draft Horses, their Blemishes and Defects. To which is now added A Supplement containing Practical Observations upon Thorm Wounds, Punctured Tendond, and Ligamentary Lameness. With Ample Instructions for their Treatment and Cure; Illustrated by a Recital of Cases, including a Variety of Useful Remarks. With a Successful Method of treating the Canine Species, in that destructive Disease called The Distemper. - William Taplin 1791 - G.G.J. 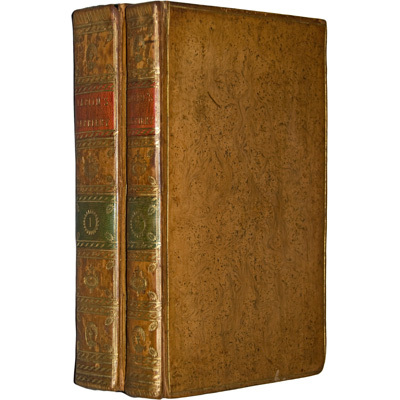 and J.Robinsons and G.Kearsley, London - The Tenth Edition, Considerably Enlarged and Carefully Corrected. Inscribed to Sir John Lade, Bart. Engraved frontispiece portrait. In 2 volumes. First published in 1788. The second volume contains "Experimental Remarks upon Breeding, Breaking, Shoeing, Stabling, Exercise, and Rowelling. To which are added, particular Instructions for the General Management of Hunters and Road Horses; with Concluding Observations upon the present State of the Turf". With the half-titles. Taplin was a part of a group of British surgeons who switched to become veterinarians. Although Taplin was disliked by his peers (he is described by Smith as being … egotistical, bombastic, … unscrupulous … And by others in equally negative descriptions) his books were popular in Great Britain and America. References: CSU Special Collections. Smith - The Early History of Veterinary Literature. Loder, Bibliography of Horse Racing, 785.